I have a small collection of hollow eggs on my kitchen counter. They each have sentimental value to me, like the first egg from my cuckoo Marans pullet, one from my porcelain silkie and several from other favorite hens. I even have a two tone guinea egg! When I decided to keep these eggs I had to hollow them out so they wouldn't spoil. I decided to blow out the eggs so I could keep them. I really thought it was going to be difficult, but it wasn't. After all, people have been hollowing out and decorating eggs for over 60,000 years! Of course back then they used ostrich eggs and did more carving than coloring, but the idea remains the same. Before you start, wash your eggs in warm soapy water and dry them. You'll start by poking a hole in each end using a thumb tack. I like using thumb tacks as opposed to a needle because they have a large end to grab onto. I used a rubber mallet to tap the thumbtack into the egg. Be very gentle, it doesn't take much to push the tip of the pin through the shell! 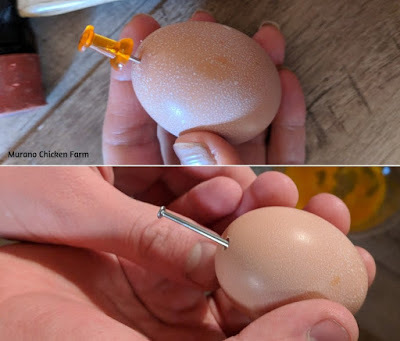 Once you have a hole in each end, use a toothpick or a nail that is slightly larger and insert it into the egg, swirling it around a little to break up the yolk. I do this on both ends making the hole on the wide end of the egg larger than the hole on the narrow end. Remove nail. Plug both ends with your finger and thumb and shake the egg a few times. You want to scramble the contents as much as possible in there. It comes out easier that way. 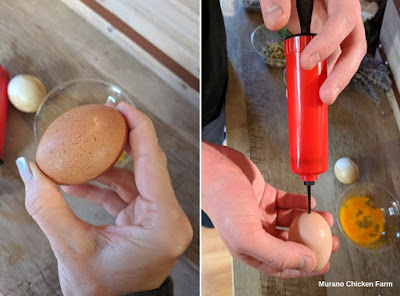 The old fashioned way of blown eggs was to actually put your mouth over the hole on the narrow end of the egg and blow the egg out the other side. I use a bicycle pump because that hurts my cheeks! I bought this pump at the dollar store. Place the stem of the pump over the hole and point the egg downward into a small bowl. Push the top down on the pump forcing egg through the bottom hole. Use slow and steady pressure. Don't press the plunger down quickly on the pump as the sudden air pressure can cause the egg to break. If the egg refuses to come out, try shaking it up again. Sometimes it can be a bit thick and require a few shakes, plus it mixes a lot better after some of the contents are already out. Sometimes thick parts of the eggs contents get stuck in the drain hole. Pull that out before adding more air to the egg. If the drain hole is plugged and too much air builds up inside the egg the sides will crack. It will sort of 'pop' open and the contents will ooze out the sides. (guess how I know that? lol) To keep that from happening, turn the egg on it's side for a few seconds to let the air out if the drain hole plugs. If you decide to forgo the pump: holding the egg wide side down over a bowl, place your mouth against the egg on the narrow end and blow firmly. Check between breaths that the contents are coming out before starting again. Once all of yolk and white is out of the eggshell, hold the egg under running water and allow some water to get into the shell. Mix this up by placing fingers on both holes and shaking. Empty into sink and allow to dry. 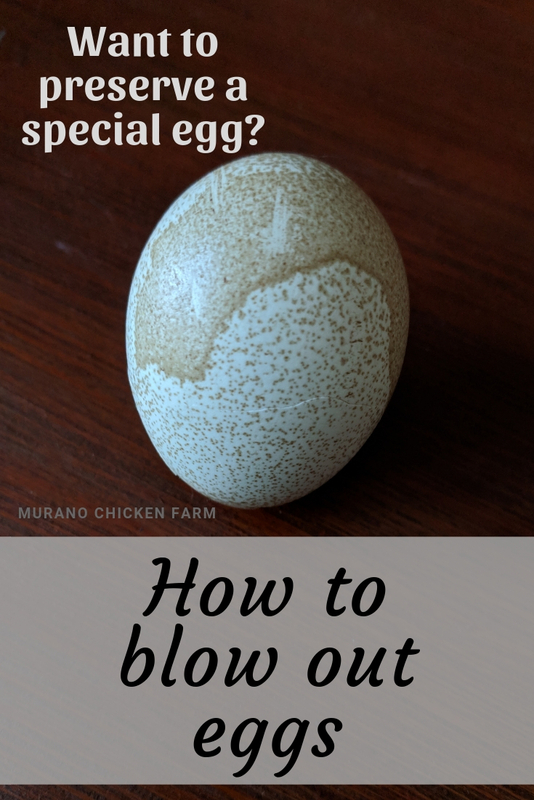 You can blow out the water the same way you blew out the eggs contents if you want to speed up the drying, or just allow it to drain. Now to decide what you want to do with your eggs! You can save them as is or you can decorate them. If you want to dye them using liquid dye (the kind used to color Easter eggs) you'll want to do that before you blow out the contents. If you do it after, the eggs won't sink in the dye and will be hard to color. It's ok to color a raw egg and it won't affect the contents. The egg that comes out of the eggshell when you blow it out is edible, though I usually just cook them for the chickens as a treat. As the egg is pierced small fragments of shell can get into the egg and since the egg is all mixed up, you might not notice them before biting into them. It's a rather gritty sensation I'd rather skip. Now that you've blown out your eggs you can decorate them with dyes, appliques, decoupage, beads and put hangers on them to display them....check out how I decorated my hollowed out eggs here:How to Decorate Blown Eggs! Want to know more about raising chickens? 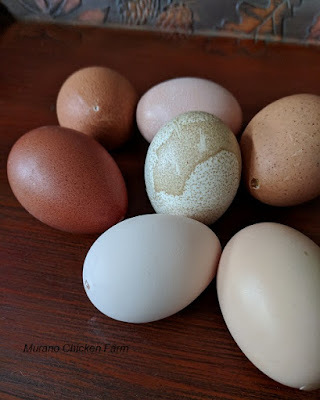 Click here for my top posts on chicken keeping! Want information on raising chickens sent right to your email weekly? Click right here to join my list and get new posts sent directly to you the day they're published ... plus, you'll also get 4 free downloads including '25 Ways to save money raising chickens'.